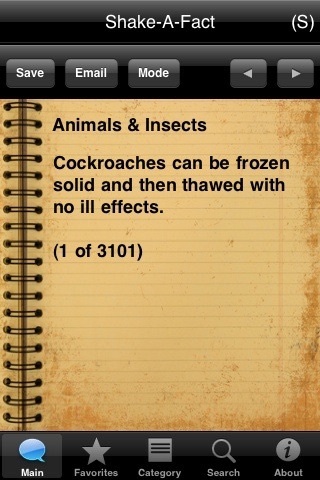 Shake-A-Fact is an application for the iPhone and iPod touch. It contains over 3000 of the most amazing facts on a large variety of subjects ranging from Animals, Business, Food, Religion, Sports, etc. This application has facts that you just won't find in other applications! - Clean, professional and very intuitive interface. - View facts in a variety of ways: Shake device, swipe left/right or push next/previous button. 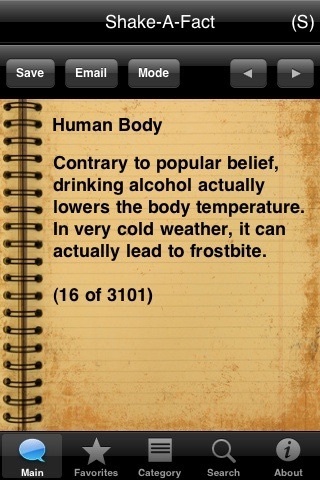 - Save you favorite facts for easy reference later. - Search the entire fact database on any word or partial word. - Browse facts by category. Currently 17 different categories. - Email facts to your friends and family. 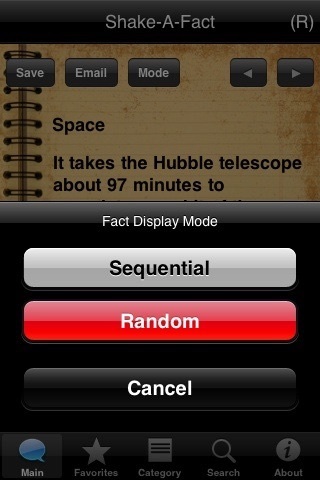 - View facts in two modes: Sequential or Random. - Scrolling feature for those long facts. - "Remembers" where you left off and starts on next fact each time you load the application. - Unlike those other fact apps, all facts have been checked for spelling, grammar and duplication. This app has all the features you would want in a fact application! It is the perfect application for road trips. Great as a conversation starter on that first date or anytime you want to kill a few spare moments. All updates to Shake-A-Fact are included and we will continue to add more great facts. Get it now and start Shaking out some Facts! Fact Categories are: Business, Entertainment, Food, History, Human Body, Inventions, Animals and Insects, People, Religion, Science, Space, Sports and Games, States, Statistics, Language, Nature. NO WIFI connection is necessary.